Just a heads-up before we begin. What you are about to read probably isn’t going to sound a whole lot like me, at least not the me you’re used to. I try very hard to keep a positive attitude when I write, and focus on the good in things. I don’t want to give in to the easy temptation of using the blog to vent, or conduct personal attacks of any sort. I try not to write angry. This post violates all of these self-imposed restrictions. In this case, I’m just going to let it all hang out. After all, my blog is all about documenting where I am in life, and right now I’m angry. Hurt and angry. So I’m just going to write this and then let it go, and hopefully release at least some of my anger and disappointment along with it. Champion. It’s such an interesting word, isn’t it? To some people, a champion is someone who wins a lot, someone who does whatever it takes to beat everyone else and claim the prize. To those people, you are probably considered a champion and will always be one. Most people agree on the qualities embodied by a champion: determination, commitment to excellence, strength, courage, focus, passion. Again, by that definition no one could deny that you are a champion among champions. But, to people like me, a champion requires one more thing, one more essential ingredient to truly elevate a person to that level, and allow the rare human being to transcend sport and serve as an example to all people of what is finest in us. That ingredient is honor. Without honor, all of those other qualities are flawed, and become potential vices. Ask Pete Rose, or Barry Bonds, or Tiger Woods. With honor, you can be Muhammad Ali, or Jackie Robinson, or Roger Federer. Closer to home, I’ve been privileged to watch some special athletes grow into champions, and teach me about honor, even if they’ve eluded wider acclaim: Steve Nash, Kurt Warner, Aeneas Williams, and in his own special way of course, Pat Tillman. But that’s not you, is it? I know that about you now. I know because you gave up the fight to clear your name just before the trial which would have made public the evidence against you. You made your excuses, and your many defenders have quickly stepped in to rationalize your decision in every imaginable way to protect you and your record, but I know the truth. I know that a true champion would die before allowing false accusations to stand, and to have a legacy of honest achievement stripped away by baseless charges. A champion who demonstrated almost superhuman tenacity on the race course, who overcame all obstacles, and who suffered and endured thousands of miles and years on the thin seat of a bicycle in wind, and rain, and freezing cold, and withering heat to win those seven cups, would not see them all taken back, and lower his head to accept the shame of being branded a cheater. Not without fighting to the last ounce of his being. Unless he lacked honor. It’s the flaw that proves the fall. I’ve heard you don’t want to spend all your money on fighting the charges anymore. That might be understandable. We all know legal costs are astonishingly exorbitant, especially in celebrity cases. But you were one of the great sports champions of all time. You had the public firmly on your side. Even without a penny, what media outlet in this country would not give you an opportunity to advocate your position, and refute the allegations against you? They’d do it because people would watch. So please, don’t make this about the money. And don’t try to tell me you’re tired of the whole thing and just want it to be over. Really? More tired than after three straight days of climbs into the Pyrenees or the Alps? Something tells me you’ve experienced exhaustion before. Yet somehow, you kept going then. Somehow you found a way to turn sheer exhaustion into more energy. What’s so different now? Where is the will to win now? Where is the determination that is so fierce it’s frightening for others to see? I thought you had everything it took to be a champion. Now, thanks to you, I have to question every athlete I see. Because if you were capable of cheating, who isn’t? Whose integrity is beyond question? No one’s, not even those people I gave as examples of the best kind of champions. Not for me. I will always have to doubt the integrity of all athletes, of all sports accomplishments, because of you. Maybe you have done me a favor, maybe there is no such thing as a clean athlete anymore. Maybe there hasn’t been for a long, long time. But even if that was the case, it didn’t make it okay for you to cheat, or to win by cheating, or to lay claim to a legacy as a result of cheating. And let’s get this part clear right now: anything you took into your body that was designed for the purpose of enhancing your athletic performance which was not available to all competitors equally and sanctioned by the rules of the sport was cheating. I don’t care if a particular substance was being tested for or not. Your careful denials and side-stepping of direct answers bespeaks your awareness of this fact. And, sorry to sound like a broken record, but it bespeaks your broken sense of integrity. Look, I’m not new to this sport. I’m familiar with the list of scandals and cheating that has plagued professional bicycling. I know corruption has always been associated with the sport, and I’m sure it continues to be rotten with it. It’s controlled by the Europeans, after all, what else would you expect? But professional bicycling is the sport you chose, and if you had honor, you would bring it with you wherever you went, whatever the circumstances. Honor isn’t an overcoat, it’s not something you take off when it gets too warm, and then pick up later when you want to wear it again. I guess that’s it. My anger is spent. I’m still royally pissed, but the anger is spent. 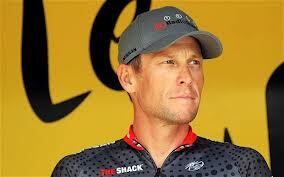 And in spite of everything, Lance, I wish you good health, and a long, happy life, I truly do. I can do that because you are no longer a champion to me, but just a person, and I don’t wish ill on any person. I hope you’re okay with that. I also hope you can continue to work hard on the foundation and the good and necessary work it does with conquering cancer. From what I know, LIVESTRONG is a great organization, and you deserve credit for initiating it and for bringing so much deserved attention to it. There. I think I’m done. I’m going to go out to the shed now, and see if I can find my old Greg LeMond gloves. They had brown leather palms, and this kind of open, macramé-type stitching on the back side of the hand. They were the first pair of bicycling gloves I ever bought, when I first began to ride further than my own neighborhood. See, I’ve been a fan of bicycling long before you came along, Lance, and I remain one now. It’s a phenomenal sport, one that tests its competitors in ways mentally, physically, and spiritually, that few, including me, can fully appreciate. I will always love this sport. I’m just waiting for a real champion to come along. Do you really feel that by bowing out of yet another lawsuit he is quitting? I have to say I wasn't a big Armstrong fan until this came along. I feel quite the opposite. I'm glad someone finally said 'Enough is enough!'. How do you 'prove' innocence? Simply, you can't. They have failed to prove his guilt thus far and he would have spent millions of dollars and another year or more of his Life saying the same story. He has a fantastic charity which can make such better use his millions and his leadership than the draining law system which already has him pegged guilty until proven innocent. Yes, I would have liked to see him fight with the last drop of blood, sweat and tears that he has, but why? Why do I need that from him? Why would that make me feel better knowing that just the fight could ruin his Life. As a cancer survivor I think he has a different perspective on how he spends his time and energy than you or I have, and I respect that fully. I don't know if he's guilty or innocent. But in the 100's of blood and urine tests they have completed there's been nothing conclusive. I'll leave that judgement between God and his conscience. My gut says innocent. I don't let a few bad apples cast suspicion on everyone. And I too would say, "Enough is enough!" Time has revealed the truth... And your gut was right!! !